The nicotine metabolite urine test checks for nicotine and its metabolites in the urine. What is a nicotine metabolite urine test? The nicotine metabolite urine test measures the nicotine metabolite levels in the urine. Why is a nicotine metabolite test important? A nicotine metabolite test can identify recent tobacco exposure over a longer period of time and differentiate between tobacco use and other nicotine replacement products. This Nicotine Metabolite Urine Test is a urine test. The nicotine metabolite test, also known as a nicotine metabolite urine test, measures nicotine metabolite urine levels. This nicotine metabolite test checks for the nicotine metabolites nicotine, anabasine, cotinine, 3-OH-cotinine, nornicotine and norcotinine in the urine. Nicotine itself has a half-life of around sixty minutes, making detecting its presence limited to more recent tobacco exposure. On the other hand, certain nicotine metabolites are present for longer periods of time and provide a longer window of detection of tobacco use. Anabasine testing is one important component of this nicotine metabolite urine test. Anabasine is an alkaloid found in the tobacco plant and is helpful for specifically identifying tobacco exposure - both smoked and smokeless. Because its origins are in tobacco, it can differentiate between tobacco exposure and the use of a nicotine patch or other nicotine replacement product. Because this is a sensitive nicotine metabolite test, second-hand, environmental tobacco smoke can lead to positive nicotine metabolite test results although actual results are generally lower than with direct tobacco smoking. To get a nicotine metabolite test near you at a Quest Diagnostics lab, simply order online and get tested at your selected lab. Nicotine metabolite lab results will be available for electronic download when available. 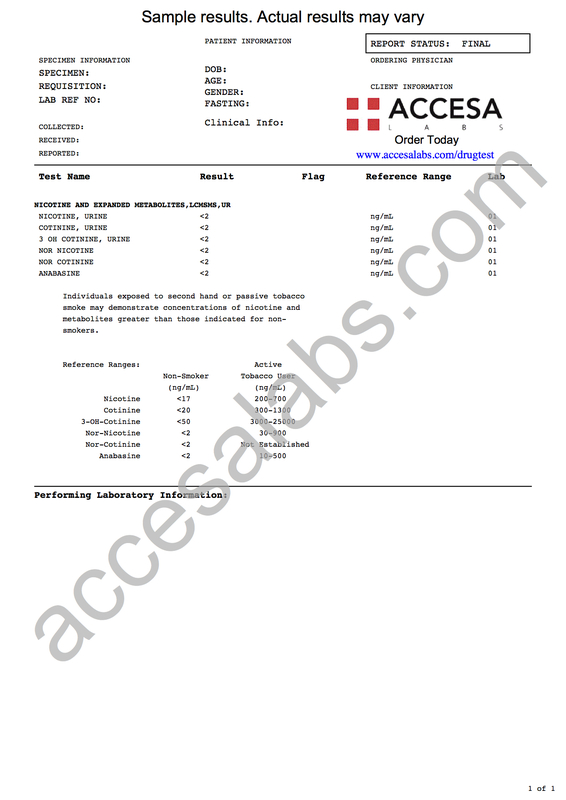 As can be seen on the sample nicotine metabolite lab results above, nicotine metabolite urine levels are reported as numerical values and can be compared against the reference ranges provided by the lab. Nicotine metabolites are not part of standard drug testing. For that, the 10 panel drug test and 7 panel drug test are better options. Nicotine Metabolite Urine Test at Guaranteed Prices.